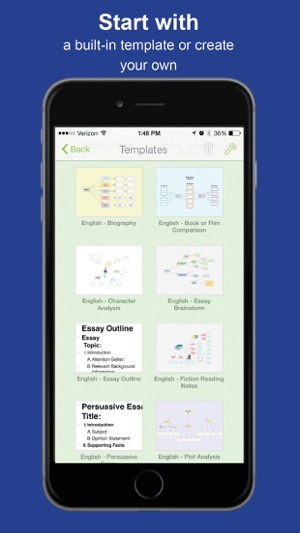 Welcome to Inspiration Maps™, the most intuitive and powerful visual learning app on the iPad. Build beautiful diagrams, graphic organisers and outlines with ease! Getting organised has never been this simple. What’s the difference between ‘INSPIRATION MAPS’ and ‘INSPIRATION MAPS VPP’? 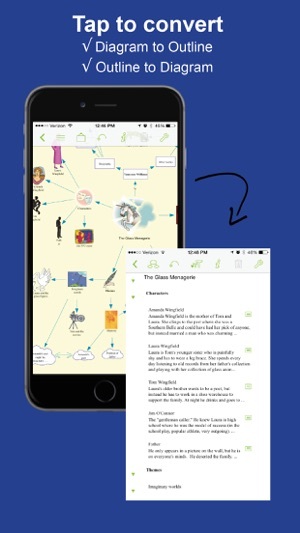 ‘Inspiration Maps’ allows you to create up to five documents to test the functionality of the app for free before using in-app purchase to upgrade to full, unlimited function. ‘Inspiration Maps VPP’ gives you all the features available in the Inspiration Maps upgrade without having to use in-app purchase to access them. ‘Inspiration Maps VPP’ exists to simplify the process for educators purchasing through Apple’s Volume Purchase Programme (VPP) for Education. 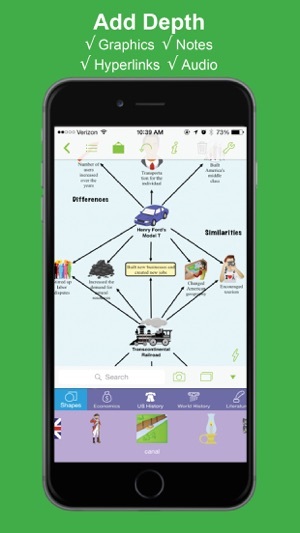 Create concept maps, cause and effect diagrams, process flows, family trees and more! Getting started couldn’t be easier: Simply double tap a blank space on your canvas to create a new idea symbol. Start from scratch or from one of the many built-in templates in language arts, history, science or thinking & planning! Harness your own creativity - there’s nothing like using Inspiration Maps’ quick-brainstorming tool RapidFire(R) to capture your ideas as fast as they come to you. Never lose track of a great idea again! Simply drag and drop to organise and categorise concepts and ideas. 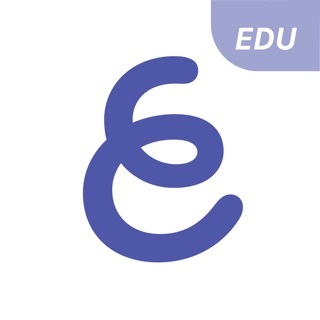 Establish connections with links and connecting phrases. Structure is automatically generated for you when you use Arrange or when you view your diagram as an outline. Use proven visual thinking and learning techniques to brainstorm ideas, explore and explain relationships, and integrate new knowledge with what you already know. Inspiration Maps encourages deeper, more critical thinking and that improves creativity, comprehension and retention. Use visual diagrams or written outlines to take notes and add details. 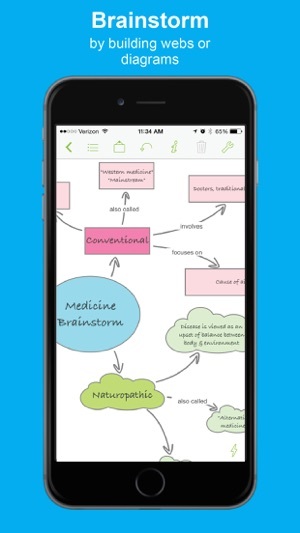 Inspiration Maps turns static outlines into dynamic, rich writing structures. 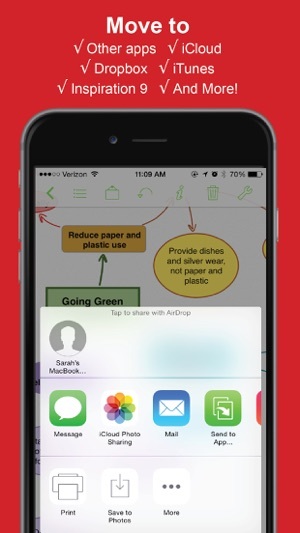 Expand on your work in Diagram View or Outline View, then export to a writing app to complete your projects. Your diagrams and outlines are entirely customisable - change background colours, line colours, link styles, fonts, and more! Add graphics from the built-in symbol library, the internet, or your own camera roll. *Feature available upon purchase of Inspiration Maps VPP. In Inspiration Maps, features is available after using in-app purchase to upgrade to full function. To receive the discount available to buyers purchasing 20 apps or more through Apple’s Volume Purchase Programme for Education, purchase ‘Inspiration Maps VPP’ (NOT ‘Inspiration Maps’). See what’s new in Inspiration Maps Version 3! - Venn Diagrams: Create 2 and 3-circle Venn diagrams to show all possible relationships between up to three sets of items. - Keyboard shortcuts: Take advantage of 30+ new keyboard shortcuts to avoid interrupting your flow to touch your screen. See a complete list of shortcuts in the Help. - Selective styling: You can now make style changes to whatever text you have selected! No more being confined to one font, colour, or size per topic. 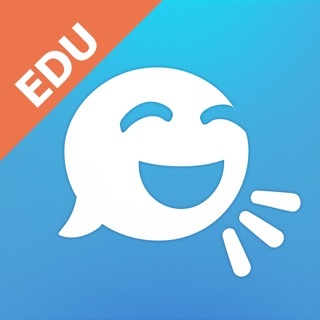 Cool comme app, facile d'accès et très utile dans les écoles. So this is one of my top, top apps. I love the visual mapping of ideas and the flexibility it gives you with organizing information. I'm also coming to love the outlining (collapsible and expandable text) capabilities of this program, that duo making it potentially my go-to program for thinking about and capturing just about anything I'd care to capture... Except: no background backup/sync function! You have to manually save to have an off-device backup or to transfer changes to another device. To me this makes it considerably less safe and convenient because I'm not the sort of person who remembers to back things up regularly, especially when most of my apps do so automatically. For this I remove a star from an otherwise well-deserved 5 star rating. © 2018 Inspiration Software, Inc.